I understand I will receive Version 3.8 today! I will also receive future updates in the 3.x series as they become available. 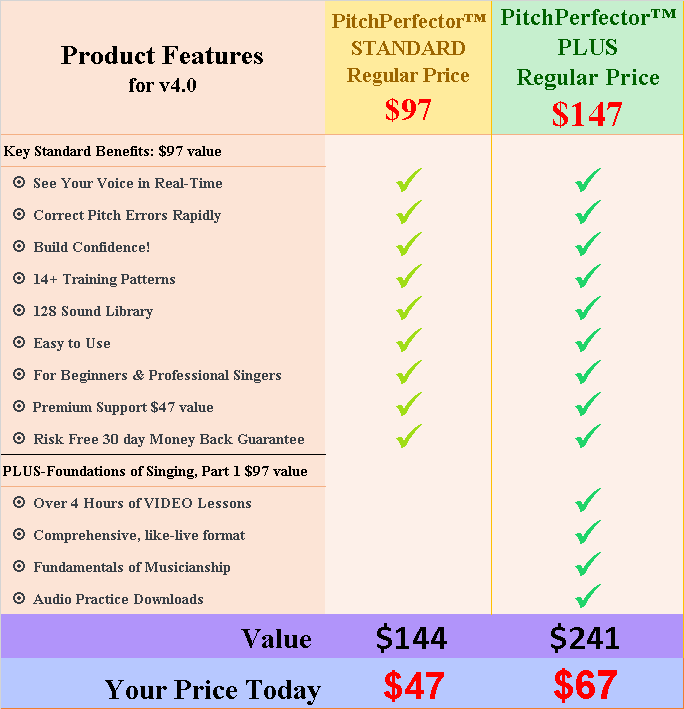 I will also receive detailed, step by step, training videos that show how to use PitchPerfector™ to solve specific voice pitch singing problems. I get instant access. I can be using On Pitch Singing – PitchPerfector™ System in less than 2 minutes, even at 2am on Sunday. 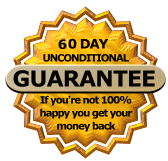 60 DAY NO RISK GUARANTEE: If you don’t like PitchPerfector™ for any reason, just remove it from your computer, and send me a message within 60 days of your order for a full refund. PS: If you’re skeptical that you can start singing on pitch in 10 minutes, take me up on my 60 day money back guarantee. Get the Program. Go through the training. If you don’t see the value, just ask, and I’ll rush you a 100% refund. MADE in the USA! – Every aspect of PitchPerfector™ was created in the USA. This includes the research, software design, development, marketing, webhosting… even the software programming tools used to create PitchPerfector™ were developed in the USA. If you don’t like PitchPerfector™, just delete from your machine, and send me a message within 60 days of your order with the subject line asking for a refund and I’ll promptly cancel your free future updates, refund 100% of your money, and apologize for wasting your time. 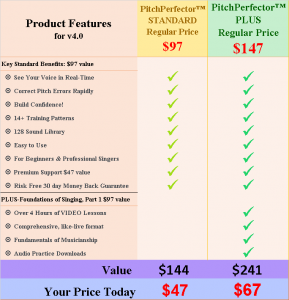 PitchPerfector v3.8 today! … future updates in the 3.x series as they become available.